Sam, I never realized the resemblance of feta fries and poutine...both a french fry and cheese plate! I do enjoy a good poutine...homemade gracy, well fried chip and gooey cheese curds but feta fries send me to food manna. Here's the dynamic I get from these fries...crisp outside, fluffy inner spud, just soft feta and pungent oregano and sea salt to round it out. This could be an entree for me. Feta with chips....Never would I have thought of that combination Sam. Pouting I've never tasted so I am not sure if I would like it or not. The extra virgin olive oil from Italy is only available here....but that is my cooking medium of choice. I clicked on your photo to enlarge it and my oh my! those fries look terrific! I hope all your visitors enlarge it as well so they can see all the cripsy goodness on those fries. My son would go wild over this. Great, great recipe! To be honest I'm not familiar with poutine. It doesn't sound like an interesting "dipping sauce" for the fries. However, your feta fries look amazing and your description is spot on! (And the photo does look great in a bigger size). Good advice also on frying the "chips". I use a 50/50 mixture of olive oil and sunflower oil. Sam, these look delicious! Any excuse to have feta cheese for me! Have you ever tried grapeseed oil? My husband and I have tried mixing it up to 50% with olive for frying. It has a very high smoke point and a mild flavor, slightly nutty, which does not overpower the olive oil but seems to possibly enhance it a bit. when I worked At "The Greek Village Inn" here in Sacramento. I had these all the time. I loved them. Homemade, handcut fries with the most amazing imported Feta Cheese. There's nothing like it. What a gorgeous idea, they look so good. Sam, so simple but so tasty!!! The combination of fries potatoes and feta cheese is super!!!! I'm with you on poutine - I had it one time and thought it was - well - disgusting. Inedible. I've never understood the attraction. But your feta fries sound terrific - great fusion food! Sam I never thought of adding feta on top of potatoes as usually all our meals are accompanied by feta. I do add oregano on top and next time shall try this. I enlarged your photo and they look terrific. About peanut oil, in Cyprus we used to cook only with peanut oil. Olive oil in Cyprus is not so refined as the Greek one, so we restrict it only to salads and some people now cook with Greek olive oil. Sam I love this dish, look sotasty! These look fantastic! I wouldn't have thought of that. Thanks for such a great idea! I love feta fries! They're a staple comfort food!! 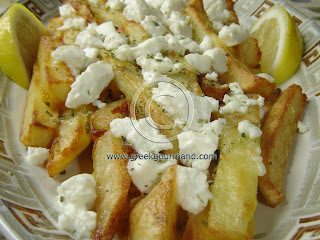 Feta and fries - yum. I also love fries with greek yogurt and a little chopped kalamata olives mixed in. those look delicious! what a great idea! thanks! I love Greek potatoes. Thanks for the fabulous quick idea. Sam these look amazing and so simple! I am not a fan of the traditional American "cheese fries" as they seem to be more like carnival food in my eyes. However...these...wow! I love feta. What a comfort food. I will definitely be making these soon! Bravo! That said, I'm dying to give your feta fries a try! I might just do the olive/peanut oil mixture. Such a beauty! I'm craving one right now! Delicious recipes, interesting comment - a really talented writer and super blog. Sue, why don't you give it a try and let me know how you liked it. As for Greek olive oil not being available to you, Italian will do as long as its high quality extra virgin olive oil. Paula, yes I agree, your son will go wild over these, but I bet you will too! Enjoy them in Good Health! Peter, Poutine is poured overtop of the fries as opposed to being a dipping sauce, but either way, I still don't like it though Peter M. does. So it's totally a personal taste thing. cj, no I have not tried grapeseed oil though I should give it a shot. Have you tried peanut oil? It's quite good as its smoke point is high and I cannot detect any flavour from it in the cooked product at all. deb, then you know what I'm talking 'bout!!! Great! ΕΛΕΝΑ, yes, oftentimes in life it is the simplest things which are best and this dish proves it. Enjoy! Laurie, seems like great minds think alike, at least where Poutine is concerned! ;) Nice to have you back! Ivy, I didn't know they cooked with peanut oil on Cyprus, thank you for that piece of info. Please give these a try, I am sure you and the family will like them. Madeline, you are welcome and enjoy! Natasha, you and my wife both! We have them a couple times a month on average and we always look forward to them. Nate-n-Annie, yes there are variations like you mention, but sometimes the simple things in life are the most enjoyable and my wife and I (and our goddaughter) prefer it this way. crunchbot, you are welcome, enjoy! Hillary, good to hear! Quick and tasty are the operative words when it comes to this recipe. the Aspirant Abecedarian, I agree completely and I think the phrase "carnival food" is an apt characterization for Poutine too. Glad to hear you liked this and I hope you enjoy them! Brett, now that does sound good, but I guess my problem with Poutine might have something to do with the fact that I have never really liked gravy (any gravy) on my fries. But by all means, give the olive and peanut oil mix a shot, I am sure you will like it. Kevin, they most certainly are! Try it out for yourself... you won't be sorry. I object to your "tasteless Québécois cheese curds". Anyone who hasn't had St-Albert (which is in Ontario actually) cheddar cheese curds MUST try them? Especially warm, they squeak. So good! There's nothing like it. But since I have developed an allergy to cows' milk, I have resorted to goat and ewe cheeses. Feta, which was reserved as a salad topper (mostly) in the past, will now make its way into my poutine tonight. I doubt I'll enjoy it as much, but like with so many other things, there is no arguing over matters of taste.